The seashore is a magical place, whether you are a witch or not. It lures and attracts us - to walk along a sandy beach or craggy cliff, to feel waves splash at our ankles, to go beachcombing or rockpooling or just to relax beside the sea and listen to the sound of gulls wheeling overhead. Just thinking about it certainly makes me want to book up a seaside holiday or escape to the coast for a weekend away. And, if you are a witch, the coast is a fantastic place to do magic, whether that is just a quiet personal meditation or big ritual with a large group. 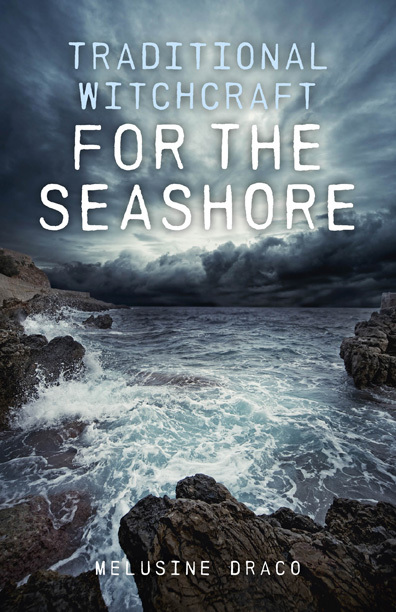 Traditional Witchcraft for the Seashore is a new book by Melusine Draco, the author of Traditional Witchcraft for Urban Living (originally published as Mean Streets Witchcraft and which I reviewed on my blog last year). Like me, Melusine is primarily a city witch - and a practical, down-to-earth one to boot. I liked her earlier book because it offered really sensible advice about such things as how to do unobtrusive spellwork in a small flat when nosey neighbours might be listening and how to spot wild plants growing on derelict building sites. Traditional Witchcraft for the Seashore follows on in the same style. It recognises that we can't all live in picturesque cottages by the coast and that if we light a huge Fire of Azrael (made famous in Dion Fortune's Book The Sea Priestess ) on some popular tourist beach we are unlikely to be left alone to peacefully scry into its embers. Instead, Melusine offers a selection of easy pathworkings and visualisations plus traditional folk spells and that you can whisper quietly or just go through mentally without saying anything aloud while sitting by the seashore or standing before the waves. The book also suggests creating a small garden containing such things as shingle, bits of driftwood, shells and plants that are happy growing on dunes and shingle or inland. Even if you live in a town or city, you can spend time in your sea garden and imagine you are by the coast. Publisher O-Books says on its website: "Although we are an island race, few are fortunate to live near enough to the sea to use the shoreline as a regular magical working area. And yet for the natural witch, born and bred by the sea, the beach and rocky shore are equally as magical as the inland woods and hills of more traditional approaches to witchcraft. The author takes us on a magical journey along the seashore and reveals how to work with the natural oceanic tides and energies. Learn how to harness the powers of the deep, and collect flotsam and jetsam for use as ritual tools." The book also explains the science and geography of the coast and the tides, and discusses traditional folklore and superstitions of those who lived and worked by or on the sea in times past. At the end is a useful list of gods and goddesses of the seas, rivers and oceans. The sea and shore can be dangerous, so advice on how to stay safe in the presence of dangerous currents and fast-rising water is another very practical addition. Traditional Witchcraft for the Seashore makes a useful companion volume to Traditional Witchcraft for Urban Living . A third book in the series is Traditional Witchcraft for the Woods and Forests, which is due to come out later this month. Melusine Draco has been a magical instructor for over 20 years and has written many books, including Liber Aegyptius: Book of Egyptian Magic and The Hollow Tree: Guide to Qabalah and Tarot . She co-wrote Root and Branch: British Magical Tree Lore. Her individualistic teaching methods and writing draws on ancient sources, supported by academic texts and current archaeological findings. You can order the paperback or download the Kindle edition of Traditional Witchcraft for the Seashore from Amazon.